New! Quickly know your members’ first 30 days. What to do when your community slows down (& why it’s not always a bad thing). Inviting new members is such an important part of keeping a community alive; not just to keep it growing, but to keep it fresh with new perspectives and goals. 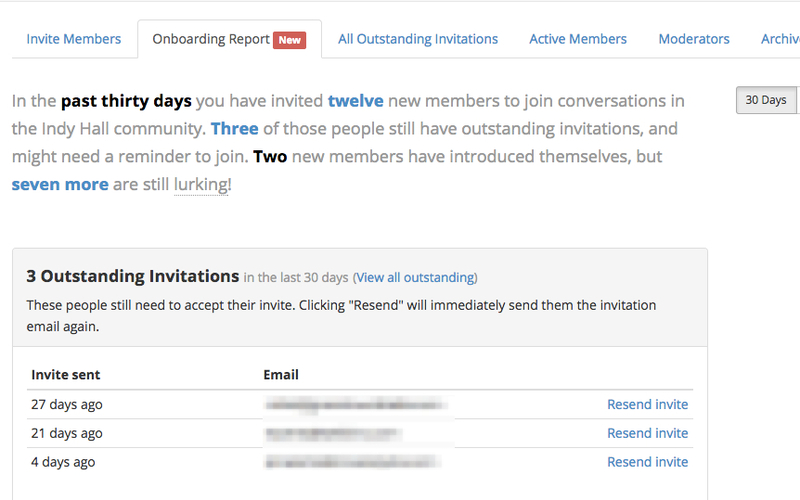 But whether you’re inviting 2, 10, 20, or even 100+ new people, what happens after you click “send” on a new batch of invites? How many people are added at a time? What is the timing between a new member receiving invite and accepting them? Where do people tend to get “stuck” in their first 30 days? Especially when communities are growing, it’s too easy to lose track of these important factors during the most crucial period of time for your newest members. And our experience (and data) backs that up! We’ve heard from multiple sources that people who are slower to accept their GroupBuzz invite, and slower to introduce themselves to the list, are much more likely to end their membership early. The first step is to even be able to notice where your members are in the process, and where they might be getting “stuck”. Now, all GroupBuzz account owners and moderators can use this new tab in the Member Manager to keep an eye on these elusive checkpoints during your members most crucial days. This new report gives you a way to glance at where your members are in the GroupBuzz onboarding process based on a few crucial participation checkpoints. Now, you can see how many new members you’ve invited and who you’re still waiting on to accept their invites. You can see how many have made their first post and who is still lurking. And since different communities work at different paces, we’ve also made it easy for you to change the timeframe of this report to 60 and 90 days, even the entire lifetime of your community. Just because somebody has slipped past the first 30 days doesn’t mean you won’t want to know how they’re doing. And of course, this is just the beginning. We’ll be revealing more participation checkpoints soon, as well as more robust ways to understand the participation patterns in your community. And like everything else, it’s all built on top of best practices for helping your community members get the most value from their participation. If you’re an owner or a moderator of a GroupBuzz community, you can take a look at this report right now by logging in and going to the Manage Members option in the navigation bar. How does it feel when somebody takes a genuine interest in you? It feels pretty good, doesn’t it. And I think the answer, in fact, is asking more questions. Tummling is a bit like “close reading” your community. As a habit, you should be looking for opportunities to strategically say things like, “Can you say more about X? How did you get into that? What brought you to the conclusion of X? etc”, here X is something that they brought up themselves. But don’t limit yourself to the specific interest that your community gathers around. Try digging your way towards peoples’ personal stories. Those personal stories are really the most powerful undercurrent of a fledgeling community, and all communities. The sooner you start discover those stories and in turn, help others discover each others stories, the better. 1) You’re showing that you’re genuinely curious about them. I sometimes talk about the burp-like ‘what do you do?’ question that most people reflexively ask when meeting someone. It’s a worthless interaction. Asking someone to talk more about about something they really care about is far, far more effective. And, when you ask these kinds of questions in front of other members, you’re showing them that curiosity isn’t just okay, it’s valued in your community. And that’s a good thing. This is where real trusting connections are built. I’m not talking about that superficial “I trust you because I don’t think you’re a bad person” kind of trust, I’m talking about “I trust you because I believe I understand who you are, as a person”. If this sounds heavy – it can be. That’s a side effect of creating something real and meaningful to other people. But asking questions doesn’t need to be done heavy-handedly. You can just make it part of the conversation. Here’s your new habit: when you hear something that triggers your “hey, I have something to say about that!” reflex, STOP YOURSELF. It can be tough! Those reflexes are 100% natural. Instead of piling on, if you’re going to say anything, save your addition for a couple turns of the conversation later. Force yourself to ask a question about that, instead. Do this once and see where the conversation goes. Do it a second time if you’re feeling good about where things are headed. The more I’ve applied this questioning habit to get me closer to root problems, the BETTER results I’ve gotten in all of my work. A lot, which is what Justin Jackson and I spent an hour or so talking about. You can watch the whole thing, unedited and in video format, below. When you’ve invested a lot of energy into building and growing a community, it’s nerve racking when activity slows down. On the surface, communities do have a natural ebb and flow to them. You can expect seasonal dips and spikes, along with natural growth and attrition of members. Did you add a wave of new members last month? There’s a good chance that you’re going to see a temporary spike of additional discussion, introductions, etc…but it won’t last. Is one of your champion community members working intensely on a project? There’s a good chance that you’re going to see a temporary dip as the conversation-starters and contributions aren’t always in the room. But what if there’s actually a problem? What if members really are losing steam? 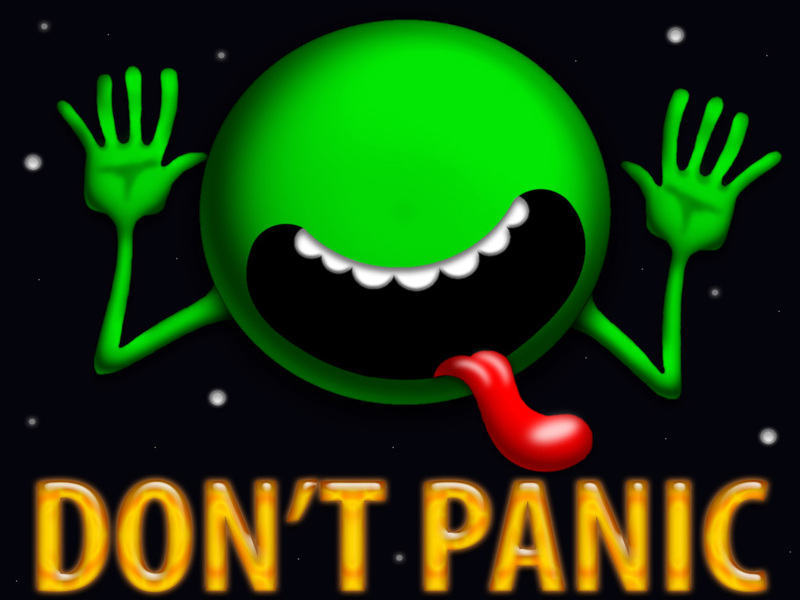 Step one comes from Douglas Adams’ best advice for humanity : Don’t panic. Sometimes it “feels” like a community has slowed down. But that doesn’t always mean something is wrong. Luckily, I have a customer story to show what I mean! One of the earliest communities using GroupBuzz are the alumni of Brennan Dunn’s Consultancy Masterclass. Brennan helped his group make the jump from Google Groups to GroupBuzz a few months back, and they’ve given us a lot of helpful insights into how different kinds of communities will use GroupBuzz in the future. Brennan asked me for my thoughts on the situation. My first piece of advice was that while some people felt like the community wasn’t active enough (which I’ll touch on in a minute), it’s just as likely that there are others in the community who thought it’s too noisy. Neither is right or wrong, this is just the fun of communities. 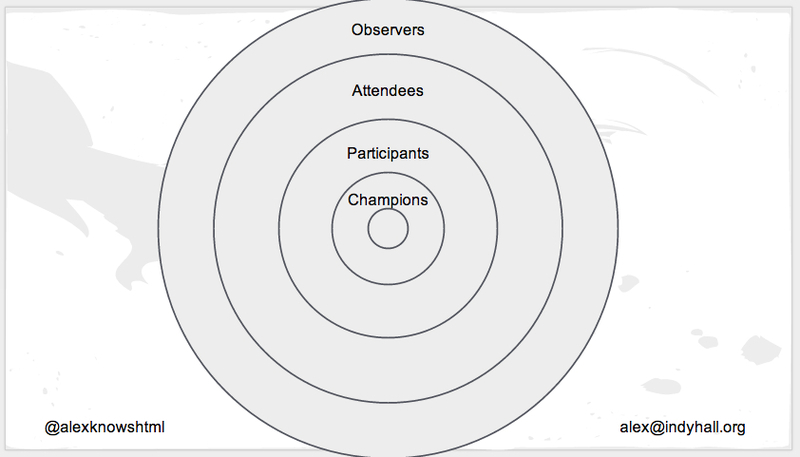 There isn’t just “participating” vs. “not participating”. In reality, it’s a bit more like a spectrum. Some people participate more, and in more active ways. Others less, and in less active ways. Neither is wrong. But more importantly, your job isn’t to get members to participate more than they are. Your job is to help members participate at a level that balances the value they RECEIVE from the community as well as the value they PROVIDE to the community. I’ll say that again because it’s so freaking important: a community managers’ job is to help members balance what they give and what they get. Not everyone participates the same way, and there’s more than one way to give and receive value from a community. I helped develop a way to visualize this with the help of two of my colleagues – Adam Teterus (also hailing from Indy Hall) and Tony Bacigalupo (from New Work City). Every community maps a bit differently onto this model, but it works pretty universally. There are a lot of very interesting things we’ve learned to do with this model, but that’s for another day and another blog post. Back to my original point: participation isn’t binary. Not everyone posts. Not everyone replies. Lurkers gonna lurk (a.k.a attendees). And inevitably, some people will vanish. That’s all 100% normal. Have you heard of the 80/20 rule? It says that 80% of the contributions will come from 20% of the contributors. This rule holds true…but not just between “posting” and “not posting anything”. Instead, you can look for the 80/20 rule in effect between each level of the bullseye model above. Only 20% of any given level of that bullseye are likely to ever move one level closer to the center. And that spread tends to result in a VERY healthy, sustainable community. So, I did a little digging into the history of Brennan’s community activity on GroupBuzz. Coming soon, you’ll be able to glance at some easy to understand reports to determine your community’s health and sustainability right in your GroupBuzz dashboard…but here’s a peek into how you can understand them now. Receive first post of each new message. Enable “firehose mode”, which sends them an email for each new post AND subsequent replies. In essence, they auto-follow every new thread. Mute everything, and diligently check up on community activity on the web. 23 on “firehose mode”, which is EXTREMELY high compared to other communities using GroupBuzz. 51% have posted anything at all in the last 30 days. I also noticed a pretty high level of “like” activity, and often from people who don’t post or comment very much. Again, reference that bullseye model from above. I also noticed that, while the overall number of threads has gone down over time, it appears that the overall percentage of members who actively contribute to the discussion in a given month has stayed strong, and even gone up. I don’t believe that Brennan’s Masterclass community was actually “slowing down”, but instead shifting to a level of activity that was manageable for more of the community to pay attention and participate. “More conversations” is a very common false proxy for more value in the community. But value isn’t created when there’s more noise, it’s created when there’s more signal. “More participation”, on the other hand, is more specific. It means that a greater percentage of the total community’s members are engaged, and at a level that balances the value they RECEIVE from the community as well as the value they PROVIDE to other members of the community. New blood isn’t the answer. And gosh, I wish it were that easy! It’s actually quite the opposite: larger, faster growing communities are much harder to keep strong and vibrant. I know this both from research and from experience: Indy Hall takes MANY times more effort to keep the participation levels high (today, we have 250+ active members) than it did at smaller scales (we were less than 100 members for most of the first 3 years. Even huge online communities – like Reddit.com – are constantly trading off new activity for quality activity as their subcommunities, called “subreddits”, evolve and grow. And I’d be remiss not to mention that getting bigger means it’s harder for members to build and earn trust. Getting to know your fellow community members becomes critical, beyond being ‘nice to have’. You can also view it in the context of a corporation: small teams tend to have the most vibrant the culture, share common goals and expectations. But when teams grow larger – and grow quickly – culture starts to atrophy. This is when the “bureaucrat” tends to take over. I’ve got a few tricks for managing growth, but they’re all about keeping things small. My party line for many of my community/culture clients is that more isn’t better. Only better is better. If you can’t make your community better with what you already have, you’ve probably got deeper rooted issues that need working through; in which case adding people is definitely going to make things worse, not better. If adding people isn’t a fast track to vibrancy, what is? The most consistent and effective way to breathe life into your community come from solving a shared problem as a group is a sure-fire way to bring people together. This is where you come in as this community’s moderator/manager/leader. Your job is to help them find something that they care about improving. Something bigger than each individual. Something that the community can benefit from. Why did they join the community? What did they hope to get out of it? Is there a feature/resource in the community they don’t participate in? Why not? What is one thing that they’d like to see the community accomplish? From these answers, you’ll begin to notice some commonalities. These common challenges and goals are great clues as to what kinds of problems could be solved to the benefit of the community at large. And that’s exactly what you’re looking to support. Encourage the community to discuss those commonalities, and support them in making improvements. A conversation surrounding things community members want to do, see or say is healthy, participatory content. It also signals an invitation for more members to contribute, or for more vocal members to witness the availability for support. One person, even a few people, can’t change the culture of a community. But you can guide your community towards being a better version of itself.